Americans’ love affair with coffee has turned into an obsession. More than half report drinking coffee at least 3.1 cups each day, totaling a $40 billion market. For some, regular coffee isn’t enough so they go for the extract: powdered caffeine. The drug is unregulated and can be sold over the counter in any pharmacy. You can even buy a one kilo bag (2.2 pounds) off Amazon and have it delivered to your doorstep. So, what’s the problem? It’s caffeine right? Well, to problem is that even a few teaspoons of the powdered caffeine mixed with a drink can potentially kill you. It’s really, really easy to overdose and, case in point, two teenagers passed away last year in separate incidents. They had no idea what they were doing, and the confusing labeling might have had something do with it. Now, the FDA has officially sent warning letters to the biggest US producers of powdered caffeine that they should change their labeling in 15 days from the issued order. The letter was sent to SPN, LLC dba Smartpowders, Purebulk Inc., Kreativ Health Inc. (doing business as Natural Food Supplements), Hard Eight Nutrition LLC and Bridge City Bulk–Bridge City LLC and calls on the companies to revise their labeling, particularly the recommended dose. For instance, one such label suggested a quarter teaspoon should be added to one serving, but one teaspoon is equivalent to ingesting 28 cups of coffee. You can easily miss it, and although most consumers are body builders who should know what they’re doing, there will always be some who have no idea. Last year, Logan Stiner in LaGrange, Ohio died of cardiac arrhythmia and seizure after he miscalculated the dose. Wade Sweatt, a 24-year-old man in Georgia, mixed the powdered caffeine with water as a substitute for… Montain Dew. He later fell into a coma and died. 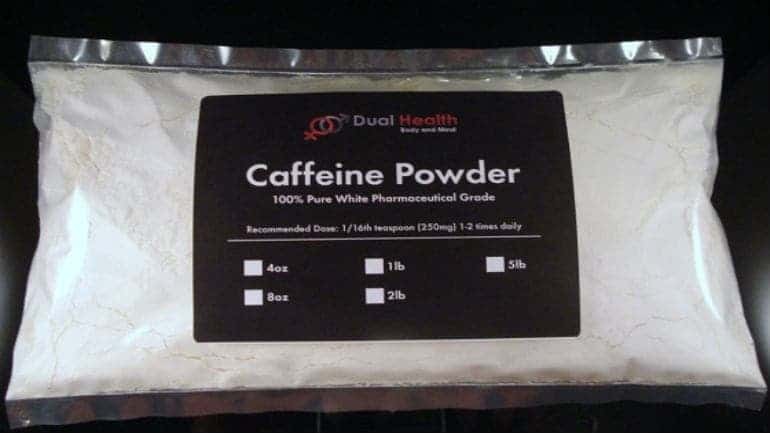 “While consumers of caffeinated products such as coffee, tea, and soda may be aware of caffeine’s less serious effects — such as nervousness and tremors — they may not be aware that these pure powdered caffeine products are much more potent and can cause serious health effects,” stated FDA in a press release. The lethal dose is considered one tablespoon or 8 grams, the equivalent to 84 cups of coffee. You’ll have to be one crazy nut to drink 84 cups of coffee. After, let’s say, 20 cups every inch of your body is begging you to stop. You can ingest a tablespoon in a jiffy though. It can be quite dangerous, especially if you have kids around, and the FDA is right to crack down on producers. In fact, just asking for more warnings and information on the label might not be enough. Maybe it’s time for powdered caffeine to become regulated.